Dr. Gary Arthur works with a patient and next Thursday offers free consultations. As a way of showing its appreciation to the community, Dr. Lisa Arthur, of Health in Balance, will provide free consultations next Thursday. The team at Health in Balance is offering complimentary therapy treatments, adjustments, B-12 shots and consultations as well as support for local charities during a community appreciation day, Thursday, Dec. 15, from 12-6 p.m. The office at 330 Park Ave., Suite 3, serves as a drop-off site for the Fire Department’s Spark of Love toy drive and is raising funds for the Roth Holistic Medical Center, to prevent and treat cancer. Chabad Jewish Center holds a countdown to The Festival of Lights with a short service from 6 – 7 p.m. Friday, Dec. 16, which will include a kids program, latkes and a buffet. On Wednesday, Dec. 21, at 4:30 p.m., the JYZ Youth Club will host pre-Chanukah festivities at Chabad, including menorah making, dreidle spinning, gift unwrapping, latke eating, and storytelling. Ages 3 – 13 are welcome; $7 per child. Lighting of the surfboard menorah takes place near sundown on Sunday, Dec. 25, on Main Beach and will include a party beginning at 2 p.m. with an Israeli DJ, dancing, a magician, crafts, face painting, dreidle cookie decorating and latkes. Free. 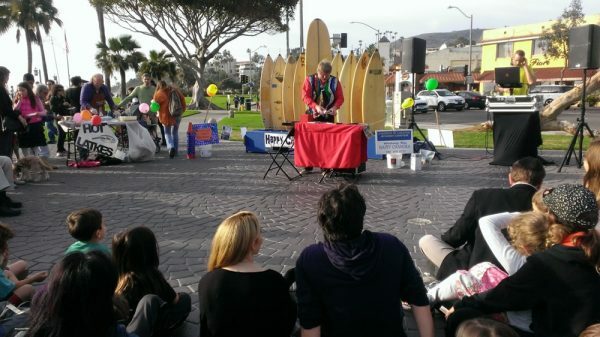 A magic act precedes lighting the surfboard menorah on Sunday, Dec. 25. Gelson’s is holding a toy drive at all of its locations through Dec. 11, collecting donations to help local children who are ill or whose families may be facing financial hardship. Donations will be distributed through Children’s Hospital in Los Angeles and Orange County, Ronald McDonald House in Long Beach, Toys for Tots, the Barbara Sinatra Center for Abused Children in Palm Springs and Rady Children’s Hospital-San Diego. New and unwrapped toys for infants, children and adolescents may be dropped at the entrances of each store. More info: gelsons.com. Input from the community is welcome at an update on the Downtown Specific Plan, which will be presented Wednesday, Dec. 14, during the Planning Commission’s regularly scheduled 6 p.m. meeting, 505 Forest Ave.
City staff will present draft amendments to the plan, which guides downtown development. It can be reviewed online at the city website. Toastmasters helps people face their fears of public speaking and build self confidence through personal growth. The Laguna Beach chapter meets every Thursday from 6 – 7:30 p.m. in a banquet room behind St. Mary’s Episcopal Church, 425 Park Ave. Recently elected President Dustin Bainbridge encourages the public to get involved with its 25 members, who range from high school students to business individuals to retired teachers. The Inn at Laguna Beach has partnered with Canvas, Paint and Wine, Oh My! to provide holiday arts and crafts lessons for guests during December. Participants can design seasonal napkins, napkin rings, plates, holiday cards and glass ornaments with sand and seashells. Reservations are required. Orange County residents Erin Machan and Belén Ramirez, founders of Project Bike Love, will make their second trip to Paraguay on beginning Dec. 14. to visit the towns of Limpio, Villeta, and Puerto Casado and deliver bicycles to women who do not have access to public transportation. Previous recipients of the bikes, which are outfitted with a basket and rack, are using them to transports goods to the local markets. The trip was made possible through the sale of PBL cycling apparel, collecting donations at local cycling events and from the generosity of organization partners.